LONDON: The Southbank is one of Europe’s largest arts centers and is celebrated worldwide for the diversity of its artistic programs. 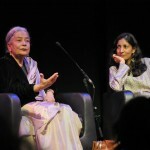 Similarly, a wide diversity of races, ethnicities and nationalities gathered in late October to celebrate the 25th anniversary of Wasafiri, the acclaimed London-based magazine of contemporary international writing. The magazine’s journey reads like a short story you might find on one of its pages. In its early days, it was was edited in various living rooms in London and Kent, while back issues were stored in an Islington pub; people routinely asked about the name, “Wasa what?,” as it sounded funny to the ears. Today, Wasafiri is regarded as Britain’s premier magazine for international contemporary writing, and it continues to expand and break new ground within the international literary and publishing landscape. “Wasafiri kept saying this is serious stuff and you should read it and it percolated through,” said Nasta. The anniversary featured words of praise for Wasafiri from a variety of literary luminaries, including Ngũgĩ wa Thiong’o, Kiran and Anita Desai, Nii Ayikwei Parkes and Fred D’Aguiar, among others. Ngũgĩ wa Thiong’o, the renowned Kenyan author, spoke about the ability of writers from different parts of the world to write in their native language without being alienated from mainstream publishing world. Thiong’o famously wrote his last novel, Wizard of the Crow, in his native Gĩkũyũ, which was subsequently translated to English. He spoke of language being like “the hard drive of a computer” in which the memories and stories of a generation is stored. The death of a language in a lifetime, he asserted, is the death of any generation. Still, many of the speakers emphasized that while Wasafiri had achieved much in its more than two-decades of publication, there was still more work to be done. In reply, Nasta, who has plans to step down as Wasafiri’s editor sometime in the next few years, acknowledged there are areas of writing she still wishes to cover. “We did an issue once on Pacific writing which I would like to do again. 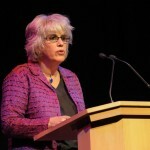 And I would like to look at North African, Middle Eastern writing and Palestinian writing more than we have,” she said. BONUS: Are African and Asian Writers Compromised by Writing in English? Belinda Otas is a versatile journalist, writer, cultural critic and an independent blogger. She has a passionate interest in Africa: politics, social development, arts and culture, gender issues and the African diaspora. Currently working as a freelance journalist with various publications aimed at the international community – she has contributed to: Al Jazeera, CNN, BBC News Online, The Africa Report, Selamta, New African, Wings, Divascribe, Zam and Under The Influence magazines, Think Africa Press and This Is Africa, among others.